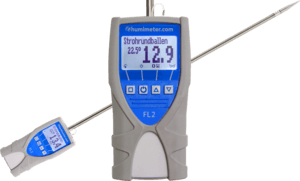 The humimeter FL2 hay moisture tester is a professional hay moisture tester with a mounted hay temperature probe. The FL2 hay moisture tester can measure temperature and moisture content of hay and straw and can be calibrated for special materials. This makes it a very versatile tool which does not only function as a hay moisture tester but can be used for other purposes as well!